Every baseball player has made an error or a series of errors during their careers. What makes some athletes develop the yips while other players recover to their previous form? Well, let’s think about for a minute… better yet, let’s not think about it. The more you think about what is wrong with you and analyze your throwing motion, the worse the yips get. 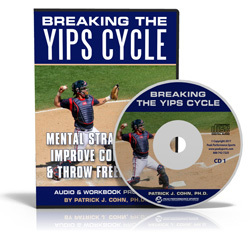 The throwing yips are a physical manifestation (hitch in your throwing motion) caused by mental factors. If you can learn to redirect your focus and trust your throwing motion (the very motion you have used effectively thousands of times), you can avoid yipping. Peter O’Brien was a highly-touted catching prospect drafted in the second round by the New York Yankees in 2012. O’Brien was traded to the Arizona Diamondbacks was invited to their 2015 spring training as a non-roster player. Diamondbacks manager Chip Hale thinks O’Brien is a great Major League prospect but admits he has some yip issues when he throws. During spring training, O’Brien had many instances of wild throws back to the mound including times with runners on base. O’Brien even had difficulty returning the ball accurately to the pitcher during warm-up throws between innings and issues getting the ball to the third baseman after bases-empty strikeouts. O’Brien has downplayed his throwing issue, instead blaming his problem on bouncing back and forth between positions. 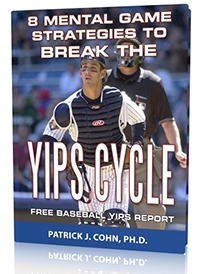 O’Brien has minimized his yips issue and his approach to fix his problem is solely focus on his physical mechanics. Over-thinking your throwing motion is what keeps you entrenched in the yips. The key to breaking the hold of the yips lies in improving the mental skill of focus. If you “throw the ball so much” like O’Brien said, there is no need to focus on the mechanics of the throw. Try saying the word “relax” as you throw instead of giving yourself mental mechanic instructions as you throw. By improving your mental game, you will optimize your potential as a baseball player.